Apologies go out to Elon Musk and Richard Branson. Their race to create the first commercial space flight has been all for naught, as Spain has beat them to it. Well, sort of beat them to it. Well, actually not at all but this video is still really cool. 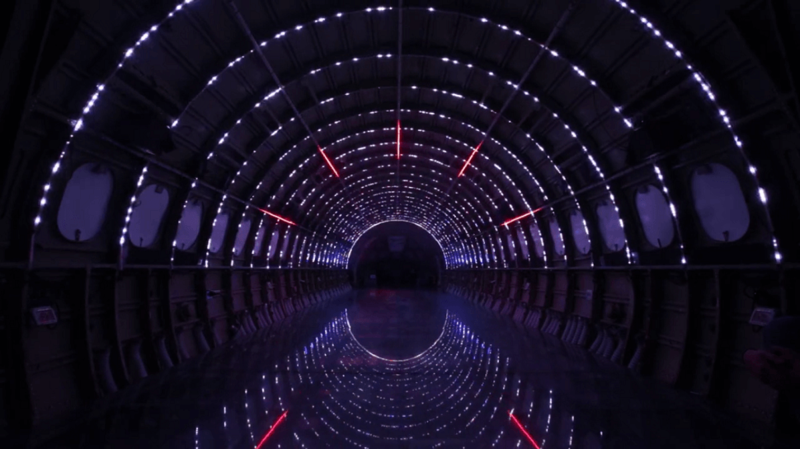 In September of 2015, PlayMID created a light and sound display that simulates interstellar travel and installed it inside the fuselage of an actual cargo plane. Called Porta Estel-Ar (The Stargate), audience members file in the plane and sit on the floor as the plane “takes off.” The display then takes them on a virtual journey through space, with the lighting simulating movement. Set to an ominous soundtrack synced with the light, travelers get the feeling that they are actually traversing the stars. There is one point that looks very similar to a certain film franchise’s light speed effect, so audience members can, in essence, understand what it felt like to be in the Millennium Falcon as it escaped the Empire. (At least in A New Hope. There was a whole thing during Empire Strikes Back). You can check out more videos from Playmodes on their Vimeo channel here. So what do you think? Would you want to partake in this “journey”? Or do you think you’d get airsick even though you aren’t moving? If space isn’t your thing, where would like to “travel”? Let me know on Twitter or sound off in the comments below.